Check out the strongest non-political skits in a season dominated by a president like no other. 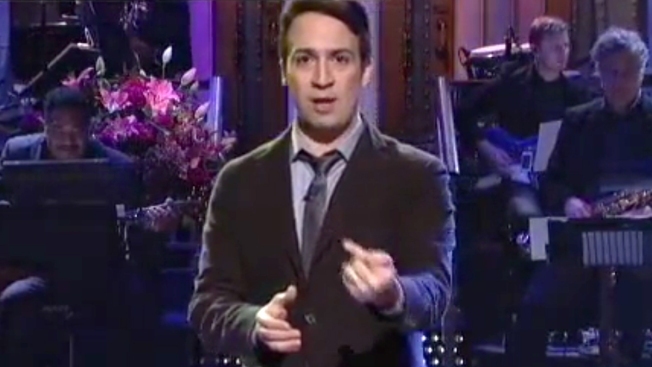 Lin Manuel Miranda starred in a standoit "SNL" short: "Diego Calls His Mom." President Trump, who is no longer a "Saturday Night Live" fan, judging from his tweets, reportedly won’t be making a return appearance anytime soon. But his rise shadows the program, from Alec Baldwin's withering Trump imitation to Melissa McCarthy's Sean Spicer-inspired antics to most of "Weekend Update." Tom Hanks' turn as Trump fan Doug on "Black Jeopardy!" marked the smartest political sketch of the season. But his haunted elevator ride as the more-annoying-than-frightening David S. Pumpkins gave the show a meme-friendly breakout character. Jokes about old folks and new, expensive gadgets might come off as a cheap shot. But this bit about senior citizens grappling with Amazon’s Alexa sports enough affection to wipe away any guilt about laughing at Grandma and Grandpa. While this so this digital short starring guest host Lin Manuel Miranda as a Latino immigrant in North Dakota calling home doesn’t mention Trump, some will see political overtones. It’s also less a knee-slapper than a source of gentle laughs, via the immigrant’s wide-eyed reports about enjoying “marshmallow salad” and “Twinkies de Hostess.” But “Diego Calls His Mom” is memorable – for its sweet take on a slice of life and its shift in tone from the usual broad “SNL” fare in a season like no other.